Handful of fresh lettuce, we used curled lettuce. RINSE the two ripe tomatoes, red bell pepper and the lettuce. DRY a handful of lettuce using the lettuce dryer. It’s no problem if you don’t have one, dry off the lettuce by shaking it and/or using a clean kitchen towel (don’t use paper towels) to dry off. SLICE the two red tomatoes in thin slices using your chef’s knife and cutting board, set aside. CUT the red bell pepper in quarters, remove the seeds and finely dice it. DRAIN liquids from the can of corn and black beans. HEAT UP the medium-sized skillet. ADD in the minced meat (without oil or butter) along with the finely diced red bell pepper. We are not using any butter or olive oil for this, because of the high amount of water inside the red bell pepper. COOK the meat until browned, season with salt and pepper. MEANWHILE, heat up the large skillet until very hot. ADD in one tortilla at the same time. BAKE one side until slightly browned, turn around and bake the other side. Again, don’t use any butter or oils for this (fun, right?). BAKE the other 3 tortillas in the same way. 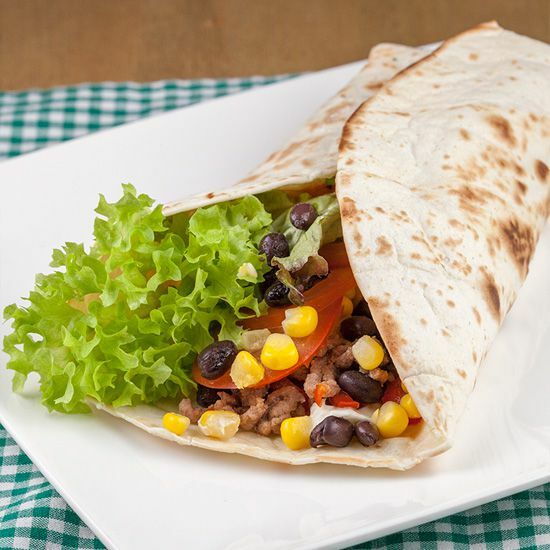 WHEN the tortillas are baked and the meat is ready, coat the tortilla with Philadelphia cream cheese. We found that using the back-side of a regular tablespoon works best for this, instead of using a bread knife. 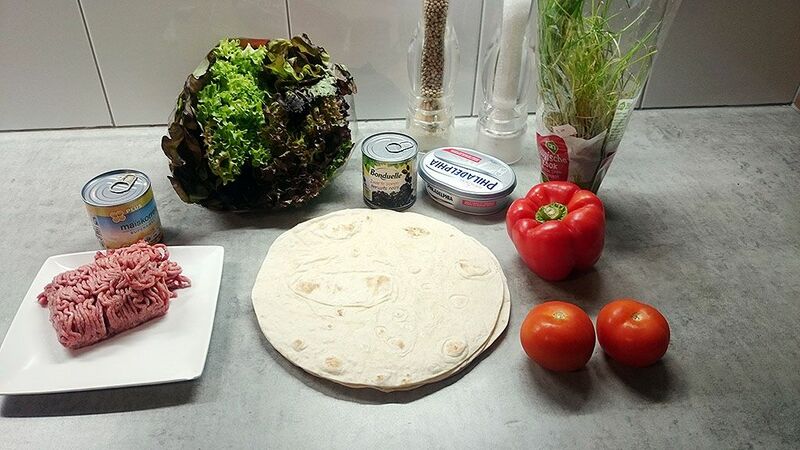 SCOOP 1-2 tablespoons of minced meat in the middle of the tortilla. 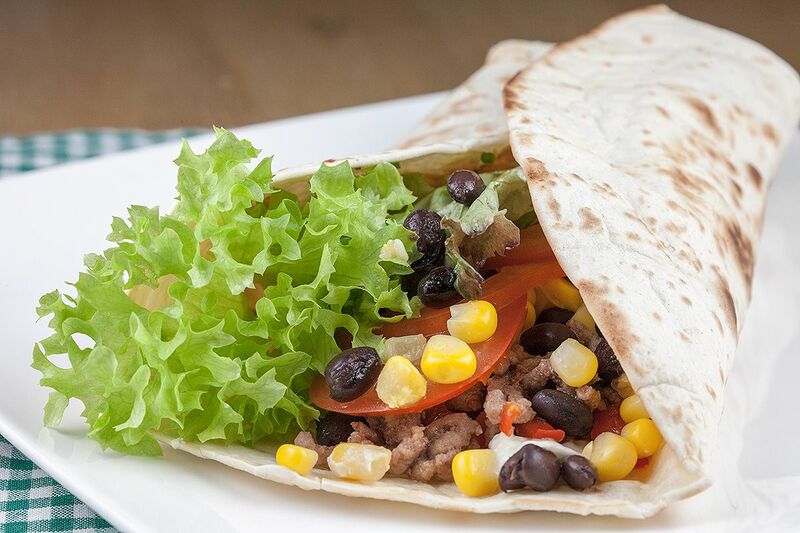 ADD lettuce, slices of tomato, corn and black beans to liking. GARNISH with finely chopped chives. Repeat this step for the other 3 tortillas, enjoy! 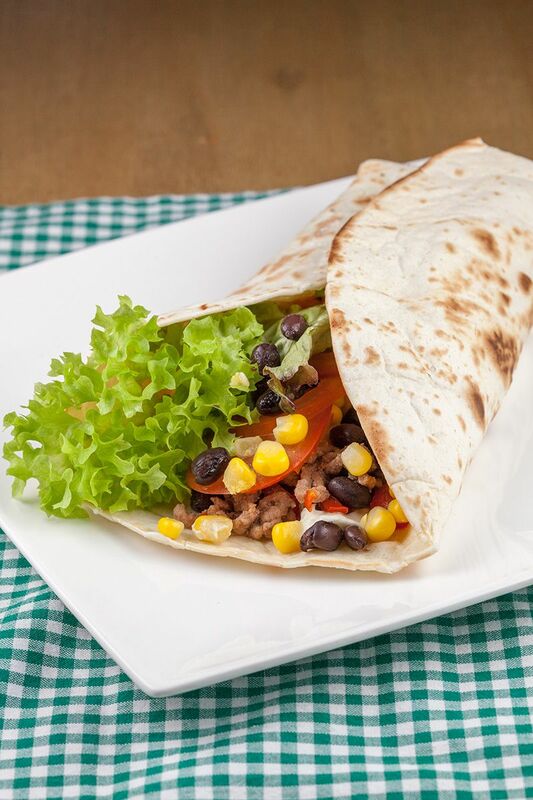 Tip: prepare the minced meat and baked tortillas one day in advance to speed up breakfast the next morning!